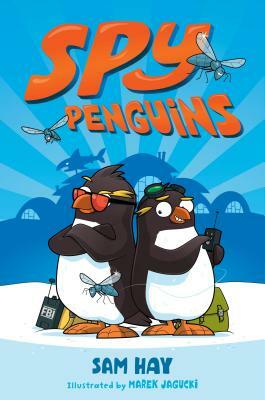 Adventure-loving penguin Jackson dreams of being a secret agent like his Uncle Bryn, who works for the Frosty Bureau of Investigation. Jackson and his gadget-inventing best friend Quigley might officially be too young to join the FBI, but they aren’t going to let that stop them! They just need to come up with the right plan to prove that they are worthy. But when one of Q’s inventions goes dangerously wrong, Jackson suddenly finds himself dropped right in the middle off an FBI stakeout. There’s fishy business afoot at the city’s aquarium; rare fish are vanishing and not even the FBI can work out what’s going on. It’s up to Jackson and Quigley to solve the crime! Sam Hay is the author of over thirty books for children including the UNDEAD PETS series (Grosset & Dunlap/Penguin US, Stripes UK) and STELLA AND THE NIGHT SPIRITS (Scholastic US). UNDEAD PETS has been translated into six languages so far. Sam also writes picture books for Egmont, including DO NOT WASH THIS BEAR, DINOSAURS UNITED (July 2017) and STAR IN THE JAR (2018). She was long-listed for the UKLA award for her 2009 novel BILLY ANGEL. Sam was brought up in Scotland and trained as a journalist in Edinburgh. After starting out in newspapers, Sam moved to London where she worked for BBC television for ten years. She still reckons working on daily live television is the perfect brain trainer for life! Sam became a full-time writer when her first baby was born and now lives in Wales with her husband and two children who provide the inspiration for many of her stories. Sam is a passionate advocate for improving literacy in schools and is a regular visitor to classrooms across the country. She has a fantastic repertoire of games and stories to get kids excited about reading.